Learn more about how to use some of the new passive skills to their full potential! In the last article, we went over how weapons will now have new passive skills. In this article, we’ll be going over some possible strategies that you can use in battle that will maximize these skills. We can hear your enemies begging for mercy already! #1 Woke Up Angry – If Hero Shield is destroyed, Hero’s blue spirit skills do +18% more damage. #2 Beast Trick – If Hero uses any blue spirit skill, 10% chance to stun enemy for two rounds. 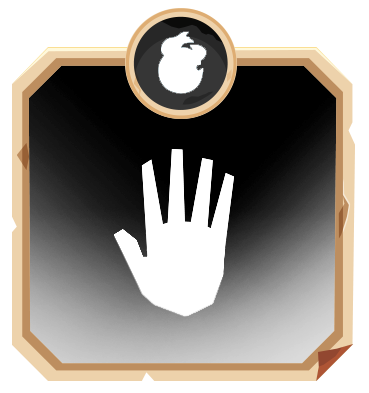 #1 Punch Avoider – If Hero HP is above 65%, enemy melee attack is reduced by 16%. #2 Last Support – If Hero uses any blue-spirit skill, 15% chance to trigger two white spirits. 2-white spirit skill – If Hero Shield is destroyed, 50% chance to activate your 2 blue-spirit skill. This will activate #2 Beast Trick, which will have a 10% chance of stunning your enemy. Also, at the same time, it will activate #2 Last Support, giving you a 15% chance to trigger two white spirits. If the odds are in your favor, Last Support will activate two white spirits, which is where the Support Talent comes in. This Talent’s 2-white spirit skill has a 50% chance to activate your 2-blue spirit skill if your Shield is destroyed. If this happens, since it is a blue-spirit skill, #2 Beast Trick re-activates and so does #2 Last Support, starting the chain all over again! Do take note that this combo will only work if your Shield is destroyed, since that is the criteria needed to activate the Support Talent’s special skill. Oh, and if your Shield is destroyed, you can count on #1 Woke Up Angry’s passive to be active: If Hero Shield is destroyed, Hero’s blue spirit skills do +18% more damage. This means all the damage done from the blue spirits, such as that first glorious skill used to start the combo, will be stronger! Were you able to follow that? Simple, right? Then let’s go on to scenario #2! We’ll be using Fang of Cruelty, Thunderbash, and another unnamed Support Talent. #1 Restore Your Faith – After Healing yourself, increase melee damage by 18% for the next 3 rounds. #2 Health Insurance – If Hero’s HP is below 45%, add +1 red spirit. #1 Attack Aid – If Hero’s Shield is destroyed, red spirit skills do 12% more damage. #2 Mighty Magic – If Hero uses a 4-spirit blue skill, automatically use a 1-spirit red skill. 4-white spirit skill – Magic attack & add +2 red-spirits to the Spirit Board. If intensity is 3, activate your 2-red spirit skill. We have three options in this scenario. We can either Heal, use a 4-blue spirit skill, or a 4-white spirit skill. This activates #1 Restore Your Faith which after Healing, will increase our melee damage by 18% for the next 3 rounds. Our melee attacks are now stronger, and if we have no Shield, #1 Attack Aid makes our red spirit skills do 12% more damage. That’s +30% damage! Now we’re ready to do some heavy damage. To take advantage of this red-spirit skill damage boost, you’ll want some red-spirits on your board! That’s where #2 Health Insurance comes in. If your HP is below 45%, each time it’s your turn, add +1 red spirit to the Spirit Board. This first option ensures our HP is at a good level, and will set us up to do extra damage in the following rounds. Also, if our HP isn’t looking too good, it can still benefit us! While this is a mage-based skill, this activates #2 Mighty Magic which means we automatically use a 1-spirit red skill! (Again, this comes at no-cost to our spirits on our Spirit Board. A one red-spirit skill might not sound strong, but it can get a little help from some of our other passives. If we healed the previous round, then #1 Restore Your Faith will give us a damage boost for this auto 1-red spirit skill that’s used. If Shieldless, #1 Attack Aid makes our red spirit skills do 12% more damage. That’s a strong magic attack, followed by a free melee-buffed red-spirit skill attack used in one turn! The second option is a way to do some magic damage, as well as get in some melee damage at the same time. This does a Magic attack & add +2 red-spirits to the Spirit Board. The good part is that if Intensity is 3, activate your 2-red spirit skill. If you’ve healed previously, then this will be great since we’ll have #1 Restore Your Faith’s passive active. 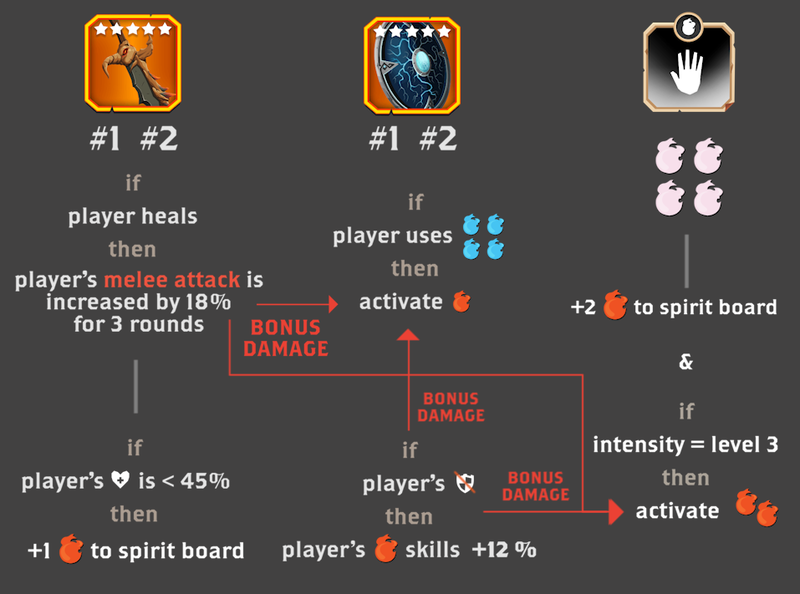 The auto-activated 2-red spirit skill will be boosted, and not only that, if we have no Shield, #1 Attack Aid makes our red spirit skills do 12% more damage. In total, using this 4-white spirit skill will do magic damage, add red spirits to the board to be used later, and finally, if we set it up right, will activate a 2-red spirit skill that will be heavily boosted! This third option not only sets up your board with more red-spirits, but also will deliver a powerful blow to your enemy. Oh, and with Intensity, each level gives a boost in damage… so that level 3 Intensity-activated red-skill will be really, really strong. We hope we didn’t lose you there! Still A Little Lost? Here’s A Video That Might Help! 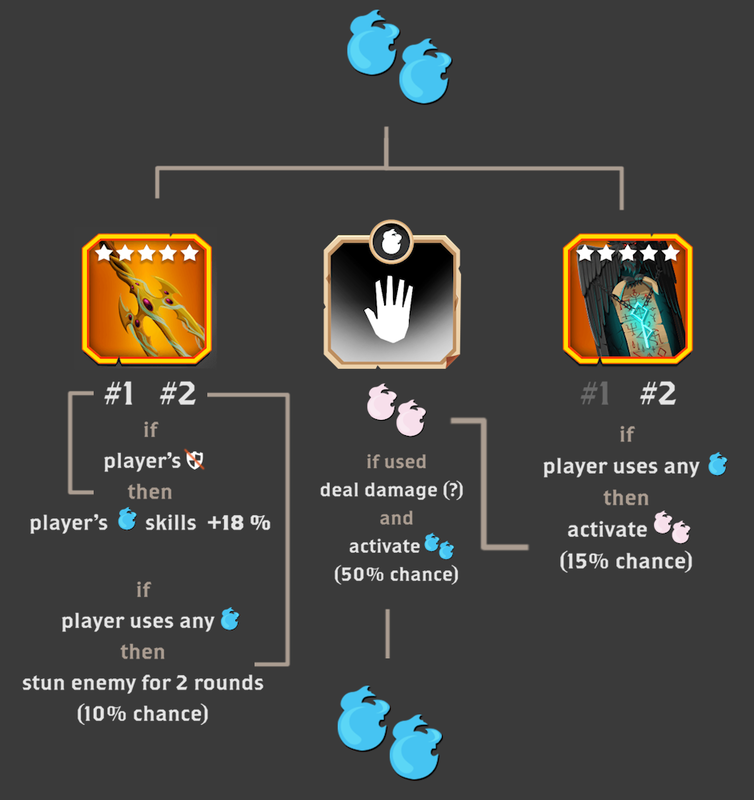 Previous post: Presenting: New Passive Skills!